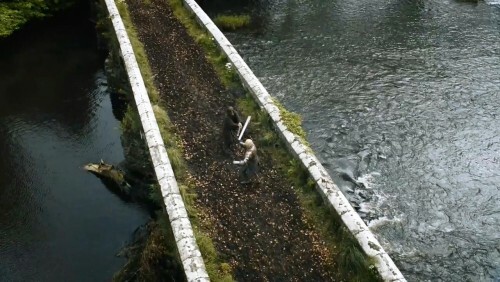 Jaime Lannister and Brienne of Tarth, in the much-anticipated fight on the bridge after he manages to get hold of a sword. In the novels, this happens when a third companion—Ser Cleos Frey—is found dead after being dragged along behind his horse following an attack by brigands. On the show, it’s clear it’s because Brienne has chosen to carry a second sword which he manages to steal from her.